Whilst we had anticipated a trip into Perth and a wander around Kings Park the weather had other ideas. Instead we took a gastronomic tour of Fremantle and beyond, starting with breakfast at The Pickled Fig cafe.Amazing french toast with a berry and fig compote and chantilly cream! A quick photo out on south beach before the rain hit, a brief relax at home to wait for Gary to get back from work and then back on the road to Little Creatures Brewery. The brewery is full of hipsters, us included of course, and the beer is good. My fav the White Rabbit Dark Ale. Next stop was the Seaview Hotel, where we collected Kimberley, detoured to Coles so she could get some cheese, and then to Clancy’s Fish Bar. Here we tried some Fried Mice – jalepenos stuffed with cheese and then deep fried in beer batter. Yes, they were spicy. Dropped Kimberley back at work and drove to City Beach and another Clancy’s Fish Bar. Cool place, great food and, had it not been for thick cloud, a perfect spot to watch a west coast sunset. Full of fish and prawns we headed back to the Seaview for a final ale. 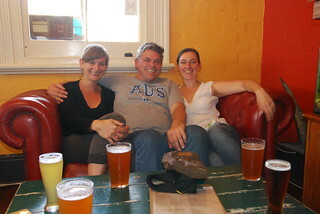 Suffice it to say, Fremantle is a great place for foodies and beer connoisseurs, of which the Lowe children are both!